CGC denotes these Australian newsstand comics as “Australian Edition” on census and on their labels. Welcome back! This is “Part II” of my look at Marvel’s 1990’s-era AUS price variants (Australian newsstand editions), a fascinating “class” of first-print, US-published cover price variants targeted to the Australian market — specifically to Australian newsstands. Before reading on, make sure you have read Part I, which introduced you to this “class” of comics using the mega-key that falls within the variant publication window: Part I: New Mutants #98 — $1.50 Cover Price Variant. CGC opted to catalog the variant under 5/91 (what appears on the cover) for the issue date, rather than 2/91 as appears in the indicia page. And then at the time of my Part I post, we saw how CGC did not indicate anywhere on the label of these variants, that the indicia month within was actually February. I mentioned how I was going to suggest an improvement to CGC when submitting my own copy, and I am pleased to be able to report that CGC has edited their Key Comments notes across New Mutants #98 and other AUS price variant examples as well, in order to include the indicia month information on the label. Public thanks to CGC for this great improvement — because it helps collectors who may be unfamiliar with this “class” of comics to grasp that they were indeed manufactured right along with the rest of the print run. Once encapsulated, that indicia information is then forever out of view and buried within the slab, so including it on the label is an important improvement. 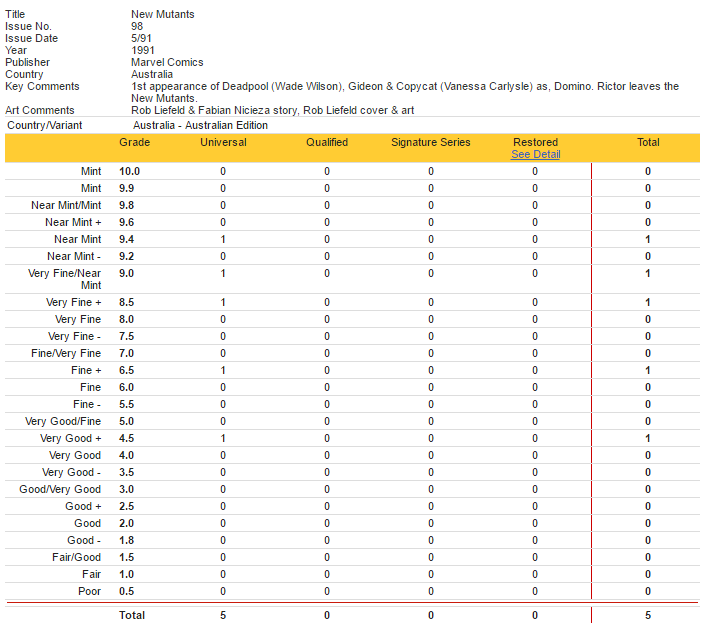 New Mutants #98 variant CGC census entry now states “Indicia reads 2/91” within the Key Comments note. Although New Mutants #98 is the mega-key within the Type 1A AUS price variant window, many other interesting comics with AUS variants are confirmed to exist as well, including some other really important keys I’ll present below. Confirming the existence of AUS price variants case-by-case from the 10/90 to 1/94 window (and the 2/96 to 11/96 window) is incredibly difficult: there are some which I expect should exist, such as Iron Man #282, but I’ve had my eyes peeled for going on six months and have yet to spot a single copy [10/26/2017 Update: Thank you to Paul Nicholls who confirmed the existence of the Iron Man #282 variant and supplied a photo! Paul also mentioned Silver Surfer v3 #44 (1st appearance of the Infinity Gauntlet) as another critically important key to list as falling into this Type 1A Cover Price Variant window]. But it makes sense that these AUS cover price copies should be next-to-impossible to find as a “class” of variants, because Australia is such a small market by population, in contrast to North America. And that small population percentage is then applied only to the newsstand slice of Marvel’s comic books… where we see a 1990 newsstand rarity estimate of 15% and a BPA audit revealing 14% newsstand sales by the beginning of 1999. Amazing Spider-Man #344, $1.50 AUS variant. Cletus Kasady eventually becomes Carnage. Amazing Spider-Man #365, $5.95 AUS variant; very high cover price; hologram cover. I always find it interesting to compare and contrast different kinds of variant comics, when considering their relative value — and during the 90’s while this AUS price variant window was open on newsstands, there were meanwhile some well known X-Men variants that were sold in conjunction with an X-Men board game. Many buyers of these board games got a variant copy of X-Men #11 included, with a silver background on the cover; and there were other variant issues distributed with the board game as well: X-Men #’s 297, 303, and 307. The Pressman variants are indeed interesting for context here… because these X-Men issues with Pressman variants also fall within our AUS price variant window by publication date. So we have a nice contrast looking at market values for these Pressman variants that collectors are already aware of and out there looking for — i.e. we can think about the following question: if NM- Pressman variant copies of X-Men #11 are going for $30-40, what should AUS price variant copies of the issue go for? Hologram covers are arguably a big piece of “1990s comic book memorabilia” and it is interesting to consider the little-known AUS cover price variant hologram copies in contrast to the blue hologram versions that collectors are already out there looking for today and paying premiums for as rare variants — because between the tiny percentage of total copies that the Australian newsstand market represented, the notorious high newsstand destruction rate, and the abnormally high per-issue cover price these hologram issues were consistently given (potentially deterring a lot of would-be buyers from opening their wallets), finding these surviving AUS cover price variant hologram covers in high grade is beyond challenging… and there are several other hologram issues I haven’t included here simply because after nearly six months of looking, I’ve yet to see a single copy come up for sale (not even a beaten-up reader copy which would at least confirm their existence). Between Pressman variants, blue hologram copies, and foil errors, these other 1990s variants help calibrate a sense of what kind of potential the AUS price variants have as a “class” of variant comics if collectors broadly start to become aware of their existence (and their extreme rarity) and begin actively looking for them. Today, the awareness of their existence has got to be extremely low out there… I count myself among those who until recently had no idea whatsoever that AUS price variant newsstand comics even existed. Even with the current low level of awareness of this “class” of variants, a recent sale of the “mega-key” example (New Mutants #98) shows their market value potential… Since the time of my “Part I” post, we have seen one New Mutants #98 copy described as the AUS price variant hit the “sold” section of eBay, with an impressive price result. The one sale was this one screen-captured below, described as VG/FN, and I can tell from the sold listings section sorted by order of highest to lowest sale price, that this variant copy fetched a higher sale price than the three books pictured below it in the following screenshot, which are: (runner-up-#1) a CBCS 9.0 copy signed by Rob Liefeld; (runner-up-#2) a CBCS 9.4 Direct Edition copy; (runner-up-#3) a CGC 9.4 Direct Edition copy. A dramatic price difference for sure, when a raw VG/FN AUS price variant copy of New Mutants #98 beats out these slabbed Near-Mint-range direct edition comps… Which prompts one to wonder: what would a Near Mint variant have sold for? What would the one single CGC 9.4 variant copy presently in existence today have sold for (as of today, 9.4 is the top grade)? And what would a near mint AUS variant copy of New Mutants #98 sell for in the future if more collectors begin to realize they actually exist and then come to comprehend their rarity as newsstand exclusives targeted to the relatively-tiny-by-population Australian market? I can’t imagine knowledge of these variants is currently very widespread… the tiny numbers and the principle of “out of sight, out of mind” has kept them nearly-invisible (the current grand-total six CGC graded copies of the New Mutants #98 AUS variant stands in stark contrast against the 12,611 CGC graded “regular” copies presently in existence… in fact, 765 “regular” copies of New Mutants #98 have been graded since year-end 2016 alone). And if that’s true that awareness of these AUS price variants is indeed on the low side today, then that means we presently have a nice window of opportunity to hunt for AUS price variants while they are still broadly under the radar and can sometimes be found out there for “regular price” listed on eBay. Hi Paul, photos would be great! 🙂 I’d sent you an email after receiving your initial comment, did that email message make it through to you? Best way to send me photos would be to reply to that email. Hi Paul, thanks for sharing those photos, I really appreciate it! 🙂 I’ve had Iron Man #282 on my watch list this entire time and your photo marks the very first one I’ve ever seen. I haven’t personally verified that this new census entry isn’t a one-off because I’ve only yet acquired my one AUS variant copy (I’d have bought 10 had I actually found more mis-listed copies but to date I’ve only landed the one). But if I’m fortunate to successfully land another in time, I will submit it to CGC with 2/91 as the date to confirm their new treatment; and when you submit yours, I’d suggest you do the same and put down 2/91 for the month. As a follow-up, someone let me know that they checked with CGC and the 2/91 entry that presently appears on the census for the New Mutants #98 variant is actually just a one-off mistake and they plan to correct the census at its next release, at which time it will be removed and only the 5/91 entry will remain. This week I got Gambit 1 miniseries and Venom 1 Lethal Protector that I have never seen before. Hi Paul, great new finds! I’m especially excited for you on the Venom Lethal Protector #1, because it is another case where collectors are already keenly aware of a highly-valued variant that can be looked to for contrast as a “comp” of sorts: the copies which were manufactured without the foil, in error; a CGC census lookup shows 180 copies currently denoted “Black Cover/Printing Error”… Meanwhile I have to imagine very few owners of that variant are even aware of the existence of the $4.50 AUS variant! I did some research with the Marvel Australian Type 1A price variants and came to an interesting conclusion in one area. I found that there are TWO not ONE beginning indicia dates found for Marvel Australian price variant books for different Marvel titles and the dates are 10/90 and 11/90. The two different indicia dates explains why there is no Australian cover price variant Amazing Spider-Man #340 10/90 indicia dated issue known to exist. I used the Marvel New Mutants title and Fantastic Four titles to prove that two starting dates exist. New Mutants Australian cover price variant books began with issue #95 and the book has a 11/90 dated indicia. The Fantastic Four Australian cover price variant books began with issue #345 and the book has a 10/90 dated indicia. I concluded that Amazing Spider-Man and Fantastic Four Australian cover price variants actually began with different indicia dates and that some Marvel Australian cover price variant titles ceased with a 12/93 dated indicia and some titles ceased with a 1/94 dated indicia. The second wave of Marvel Australian cover price variants published 2/96-11/96 all have the same beginning indicia date which is 2/96. I live here in the USA. In regards to your question of do Wolverine and Incredible Hulk 377 exist as AUS cover price variants I would have to say that there is a very good chance that they do as well as Marvels Infinity Gauntlet #1. I truly believe ALL the Marvel 10/90-1/94 AUS cover price variants were published, but they are extremely scarce and seldom seen or found out there, even on Australian eBay!. Also one might note that an Amazing Spider-Man 361 CGC 9.8!!! Australian cover price variant sold on eBay about 5 years ago. Can one imagine the value of that 9.8 copy today being that a CGC 9.4 copy went for $1,200.00 on eBay in 2017. Wow! it is truly amazing that you say you have a raw NM raw grade copy of New Mutants #98 AUS that you feel will grade a 9.4 or higher by CGC and I look forward to seeing what it grades out at. What Australian Price Variants do you have ?? Hi Paul, Hulk 377 is one I’ve been trying to find too (ever since learning about AUS variants), without even a hint of success (I haven’t even sighted one, let alone a high grade copy). My latest AUS variant acquisition was Spectacular Spider-Man #189 — I feel such nostalgia looking at that awesome hologram cover 🙂 — and this particular copy was a stunner compared to any others I’d seen. It is now back from CGC (first one on census for the issue) and achieved a 9.0! Yes! I own a Hulk 377 Aussie variant. It does exist. I have Ghost Rider 23 Aus and I’m sure there’s a lot more before that. Woo hoo!! I’m so excited you’re taking this on! 🙂 Here are some pictures below to confirm some needed issues. Hi Paul, thanks for the encouragement. I found your Google site the other day and you’re clearly a man who loves his comics – and variants! Good to find another AUS fan. I’ve found another 10 AUS copies since the post so we’re over the 700 mark now. Would you mind posting pictures of the Alf / Clive Barkers if you have them? To preserve the integrity of the data I only list a book as confirmed when I have pictorial evidence, otherwise you lose track (and can’t prove the existence if / when challenged). I’m not sure how to contact you directly – is there a way? Ha! I’ve found a raft of Clive Barker’s on eBay just now. The mistake I was making was putting ‘Barkers’ as the search. They only come up with ‘Barker’ for some reason. All good fun. I couldn’t find any Alf’s though…. I spotted this Amazing Spider-Man 361 AUS variant on line the other day. Wow! a CGC 9.8!!! Cheers! We’re on 820 confirmed copies now across 81 titles. I’ll post a full update soon. Nice. We were only just talking about them in my CGC thread. Shame about the sellers price. I see that the Cover E (according to the GCD) in the lot is the US copy (price on the back). I wonder if that exists as an AUS too? If so, you’d have thought it would be an AUS copy, sitting next to the other four. p.s. Seeing the above makes me wonder — they now place the variant cover price on the right-hand side of the labels for AUS price variants and Canadian price variants, which is two of the three known instances of Type 1A variants that Marvel published… so has CGC also now started to note the variant cover price on the right-hand side of the label for pence price variants as well? Whilst I don’t know if they are, I wouldn’t see a need for CGC to put the pence price on the CGC label as it is clearly in a different currency. The CAD and AUS copies could be mistaken for US prices given that they are all in dollars. A pence symbol / price can’t be. The country designation is enough in my view (“UK Edition”, “Australian Edition”, “Canadian Edition”) although I would personally like to see “first printing” added to that to remove any doubt that the book was so produced. Only if there were price variants within price variants, for example, two AUS copies of the same comic with different AUS prices, would it make sense to add that detail to the label. In all other cases where there is only one price, the AUS/Canadian/UK Edition designation is sufficient to identify the variance, and you can then see the price on the comic itself. Good spot on CGCs approach though. Hi everyone, I just received a $1.80 AUS Iron Man #282 variant back from CGC and wanted to follow-up on the observation on the X-Men #1 variant from a couple of months back, where it appeared that CGC changed their treatment of our AUS variants in two ways: listing the variant cover price on the right-hand of the label, and, re-thinking which month they categorize the variants under in their system to now go by the indicia month. This is great: people looking up Iron Man #282 on census will see this variant right there in the “main” record which should be a longer-term incremental positive for AUS variant awareness among collectors. I like this treatment way better than the prior method of cataloging the issue by the cover month and then mentioning the indicia date on the right-hand side of the label, but, I notice that CGC has not (yet) “ported over” prior AUS variants to this new treatment. For example, New Mutants #98 still has two census entries — 2/91 and 5/91 — and all the AUS variants are over in the 5/91 entry (which then has the label note “Indicia reads 2/91” on the right-hand side). Similar with ASM #361. So this leaves me wondering: does CGC plan on “fixing” the old census entries for AUS variants on a “piecemeal” basis (i.e. next time a New Mutants #98 variant comes through their doors they’ll change the census), or what? Will it take a collector actively asking them for us to see a change to the census for other issues with AUS variants previously catalogued? Next time someone submits one of the variants with an older census entry, I hope you’ll take a moment to contact CGC and request they apply the “new treatment” as given to X-Men #1 and Iron Man #282, and port over the old entry to use the indicia month as the issue date! On Sunday I Bought the First ever Double Cover Of These Australian Price Variants that I have ever seen. Hi Paul, awesome news on your double cover find (also your ASM #361 and Venom #1 in 9.8 [WOW! ], and New Mutants #100 in 9.6!). That they treated your books differently within the same submission suggests to me that CGC might not have a plan to automatically “port over” their old entries for the AUS variants they had cataloged prior to this new treatment… Hopefully they would still do so upon request if a customer asks them either on a new submission or a reholder? It would definitely be nice to have some consistency so I hope at some point those older entries get updated to the new treatment! – Ben p.s. I haven’t signed up to access MeWe but I heard that a lot of Google+ sites were moving there. I find it very interesting that Google+ was deemed a failure and that they elected to shut it down.